The Open Knowledge Hub (OKHub) is a collaborative initiative led by IDS to make good quality research accessible in an original way. 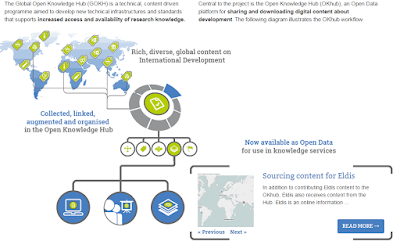 In its essence the OKHub is a “database of open-licensed metadata (bibliographic data and links) about research documents, organisations, and other materials.” Around 20 knowledge partners such as Eldis and 3iE contribute their content to the platform, including titles, URLs, abstracts and summaries, keywords, etc, of the research publications in their catalogues. To date, the OKHub contains over 20767 documents. You can browse and search this wealth of information by different criteria (e.g. themes, languages, regions and countries, etc.) on the Content Explorer. But collecting, aggregating and organizing this global content is only half of what the OKHub offers. In fact, the OKHub uses the same open infrastructure and technology to allow you to use its content to set up your own knowledge services. Services such as BRIDGE and the Gender Hub are integrating OKHub contents to expand their online collections. Earlier this year I supported the development of a prototype website that makes use of the OKHub dataset and functionality to presents selected research on Challenges to Development in the Arab World. The OKHub offers functionality for developers and site ‘builders’ to re-use its content. You can use a simple HTML widget to display selected resources from the OKHub catalogue. Alternatively, if your website is built on Wordpress or Drupal, you can use a plugin to seamlessly import selected contents from the Hub into your own site. For the Challenges to Development prototype, we experimented both with solutions. Eventually, as the site is build on Wordpress, we downloaded and installed the OKHub plugin to import around 140 free Open Licensed content items relevant for the 10 key issues covered by the prototype. These contents are aggregated on the resources page and presented separately on each thematic page. Together with this open content imported from the OKHub, the proof of concept also provides two spaces for content creation and curation: a section to present featured publications and a blogging space to share relevant highlights from the MENA region. This project was rather short and straightforward, but there are three key lessons that I think it’s worth sharing. Actually, two. On the one hand, as knowledge producer or intermediary, you can make use of the OKHub technology and infrastructure to contribute the content of your organization, thus increasing its visibility, availability and accessibility. On the other hand, The WP plugin has huge potential, as it allows non programmers to easily import content and augment their own knowledge service, or create a new one. Open content and automation alone are clearly not enough. If you want to maximise the chance of research uptake, the human factor is key. This means using a moderator with the required regional or thematic knowledge for quality control purposes and to tailor imported content to specific stakeholders. But it also means having resources to create your own original content, to curate and repackage existing content, to build and animate a community around your service, to ensure users are interested and engaged. The HTML widget and WP plugin enable less technical people, with a basic knowledge of HTML and CMS, to “plug-and-play” and build applications which meet their needs. However, you may still need some programming skills, to be able to fully integrate OKHub content on your own site. In my case, there was a conflict between the WP plugin and the site theme, resulting in individual records not fully displaying, or altering the site layout. Thanks to our colleague Tony Murray for stepping in and getting well beyond where my technical knowledge ends! Overall, the prototype offers a good proof of concept for the idea that open knowledge and collaborative approaches can help extend outreach and uptake of research knowledge. Do you know other examples on initiative of knowledge services based on Open Data to sharing and use development research content? Let us know in the comments below!